The door that you thought the story never would open is, of course, the one door that must be broken down. I like serials, big stories that go on for a long time. And one of the best things about them is how they set up expectations and repeat those expectations and then subvert them, completely breaking down the door of the story so that a new kind of story can come pouring in. One of the finest examples I’ve ever seen was on—Game of Thrones? No. Downton Abbey? No. Antiques Roadshow. I’m a Roadshow fan. Like a good soap opera, or a good serial, it repeats the same stories over and over. 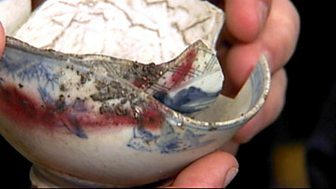 There’s the old couple who go yard-saling every weekend, and the ugly little pot they buy for a dollar turns out to be by George Ohr, the Mad Potter of Biloxi, and worth thousands. There’s the teenager who shovels snow for an elderly neighbor and gets given some old posters. The painting in the attic. The motorcycle in the barn. The guitar—there’s always a guitar, and it’s always a Gibson. There are the sad stories too. The woman who’s always treasured her grandmother’s little painting that a neighbor made and gave her. It reminds her of her grandmother, but she suddenly realizes it will pay for a grandkid’s whole college education and she’s got to sell it. The woman who’s been happily wearing her gaudy yard-sale necklace with her jeans and sneakers, who finds that her tacky little sparkler is made of real rubies and real emeralds and is Mughal nineteenth century and is far too valuable for her to enjoy. And then there are the stories that break down the door. It was on the English Roadshow (if you want to look it up, it’s Norwich, part 2). A middle-aged man brought in a couple of undistinguished bowls, all smoky and cracked and with the glaze lumpy and running. They looked like they’d been through a kiln disaster. The appraiser started with a value. “These bowls are worth nothing.” One was Japanese, 1930s, the other was Staffordshire; there were millions just like them. So why were they on the Roadshow? A good serial breaks down the doors of stories. It sets up stories, comfortable ones like Roadshow or disquieting ones like Game of Thrones or Harry Potter. You think you know the story rules. And then the rules are broken. Albus Dumbledore can’t be dead! They can’t kill Jon Snow! The characters change; what they do changes. And you realize, oh yes, that was where the story had to go all along; that was the bigger story in the one you thought you knew. The door that you thought the story never would open was, of course, the one door that had to be broken down. Those moments? They’re what we read long stories for.